AIESEC, information seminar regarding international internships will be organised at December 18, Tuesday. 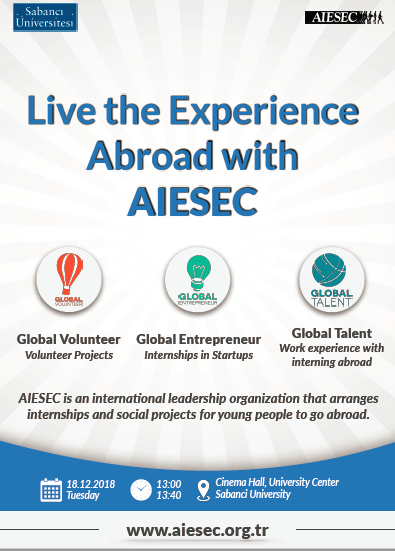 Aiesec, is a youth-run non-govermental organisation providing students and recent graduates professional and volunteer experiences ranging from global internships to dynamic leadership programs on campus. Global Talent: Global Talent enables young people to gain relevant skills for their future careers by working within a global environment within small to medium sized businesses, multi-national corporations and NGO's. Global Citizen: Global Citizen is an intensive international volunteer abroad experience that enables you to work on projects that impact social issues. Leadership: To gain holistic experience AIESEC offers you the opportunity to take on a leadership role on top of the opportunities for international volunteering and internships.